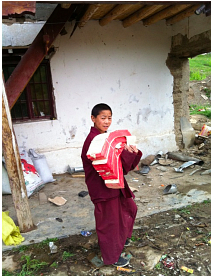 Help rebuild Kilung Rinpoche's family home in Tibet, and provide a new home for Lama Namkha Senge. Exciting times at Kilung Monastery! 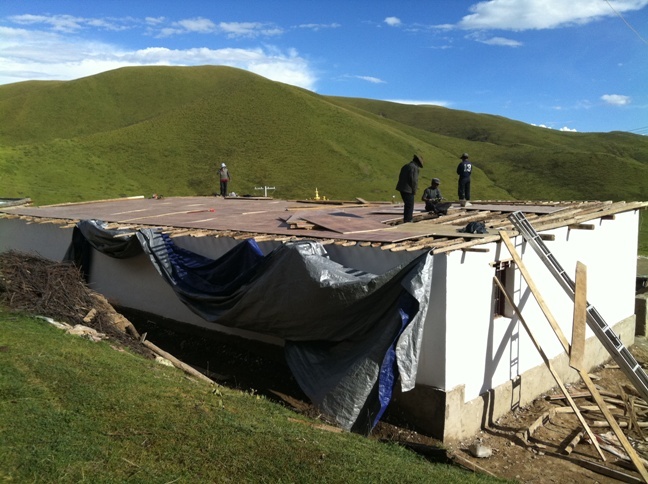 In our September newsletter, we wrote about the collapse of Namkha Senge Rinpoche’s house at Kilung Monastery in Dzachuka, Tibet. Then, Rinpoche's original home at the Kilung Monastery house had to be demolished to avoid a life-threatening collapse! 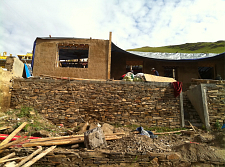 We're still seeking $6,000 for these reconstruction projects that need to be completed before the fast approaching frigid Tibetan winter sets in! Your immediate assistance would be of great benefit to the Kilung community. After the September newsletter went to press, we received word from Tibet that another important building at the monastery was no longer safe to be occupied. This second building was Kilung Rinpoche’s old two-story house, built by his father and brothers in the early 1980's when they received permission from the Chinese to restore the monastery. In more recent times, it had been used by Kilung Rinpoche as his headquarters, office, library and shrine room, by his young nephews and grandnephews who were monks and students at the monastery, and by the Kilung Children’s School. One-third of the building had already collapsed, and after temporary repairs, was still being used. But, as the winter approached, the risk of tragic injuries or loss of life in this unsafe building was simply unacceptable. Many sacred texts were in the house and needed to be removed immediately. The decision to tear down and reconstruct Rinpoche’s family home was difficult, but the timing was very fortunate. The monastery’s construction crew was nearby and had just completed repairs at the new Sershul House. They quickly demolished the old two-story house and built a new one-story house. The new house is constructed almost entirely of recycled building materials from the old house, as well as left-over materials from the recently completed monks’ cabins. The walls are made of strong rammed earth and there is a metal roof--much sturdier than the original building. Because this construction crew had built many other projects at the monastery, there was an atmosphere of mutual trust. The crew was willing to complete the entire project without requiring any advance payment. In September, before leaving Dzachuka to return to America, Kilung Rinpoche promised the construction workers that he would send their wages right away. Time is truly of the essence for all parties involved, as the monastery workers need their pay before returning to their local communities for the winter; and the monastery needs these projects completed before window of opportunity for construction projects closes with the rapid approach of winter. 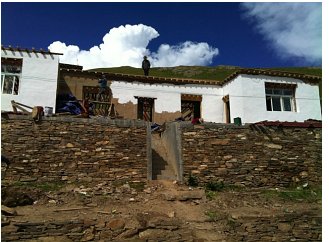 The total cost of rebuilding Kilung Rinpoche’s old house and Namkha Senge’s house is $15,000. Of this amount, the first $9,000 was quickly raised from a small group of generous supporters. The Kilung Foundation is urgently seeking to raise the remaining $6,000. Your contribution will enable the Foundation to honor Kilung Rinpoche’s commitments to the monastery’s workers before they return to their homes for the winter, and also provide Namkha Senge Rinpoche with a new home before winter sets in. Please give whatever you can to help Kilung Rinpoche complete these vital projects in Tibet. Kilung Foundation is a tax-deductible 501(c)3 organization. We are a tax-deductible 501c3 organization. We're using a new system for emails, so set your program to accept this as Not-Spam! For more information about the Kilung Foundation and our various projects in Dzachuka, please see our website at www.kilung.org. If you would like to help support our other projects in Tibet, please consider a contribution to our General Fund.